This past Thursday I attended the press launch of Reds True Barbeque in Nottingham. Now I know that I usually comment that I shy away from such events despite the continual invites, but I decided to break that habit on this occasion for a few reasons. I could say that I was kind of curious to see what a launch night would be like, but more honestly, it was cold, I didn’t want to cook, and I was really curious to see what Reds had done to my beloved Fopp Record Shop! I have to disclose up front that I was basically on a freebie here, I wasn’t paying for any of the food I ate and until I walk in through the door as a real genuine paying punter I am not sure that I can give the true impression of the daily life eating BBQ here at Reds. But hey I am not going to let any of that stop me posting my thoughts, after all it didn’t stop me scoffing at this self proclaimed house of BBQ worship. So even though part of me feels that I am not ready to write a post about Reds yet, part of me feels that it’s worth jotting down some first impressions. All the photos I took were awful and do not really give the food true justice, but it was dimly lit in there, and it was the best I could manage. I wouldn’t normally post them and some posts I would have made another trip to a place and eaten all the same stuff just to get a better pic. So until I get here in daylight hours and take something decent, you will have to make do with the following dimly lit efforts, or head over here yourself to eat them in person (if you so chose). To make life easier for all, the freebie punters, the kitchen, and the waiting staff, everyone was being given a platter of starters to get going with. This was a good idea and if nothing else it has given me an idea of some of the things that I would eat when I come in with my fistful of BBQ dollars. So what did we sample? Most of the starters were quite decent. The platter did in the end have a lot of the items that I would have liked to try anyway. Not full portions just little nibbles and tasters. There were a couple of wings, drummete and wingette, these were nicely cooked, juicy, a fair amount of meat, with a nice crispy and sticky skin. The actual menu described these as ‘Wood Smoked Jumbo Wings’ if you paid for these a small portion would have set you back £4.95 and you could have them Mild or Extra Hot. Ours were Mild with a blue cheese dipping sauce alongside. I would pay for these. The thing that I enjoyed the most and that I had actually been looking forward to trying were the ‘Burnt Ends’ I am a big fan of these anyway and I had been glad to see these on the menu. What am I talking about? I imagine, that I hear you ask (just so that I can give more info for the sake of the post), “Burnt Ends?”. The burnt ends are cut off the point of a piece of barbequed brisket, its a Kansas City BBQ kind of thing. In general I like them, and I like them a lot so I was happy to see them on that starter platter. The menu described them as ‘Thrice smoked nuggets of pure brisket gold’. They were to be one of my highlights of the evening (or hour or so I spent here). Would I pay the £7.95 price point for them? I am not sure that I would, but they were very tasty nonetheless. The other two items on the platter were a couple of bacon wrapped jalapenos, filled with some sort of soft cheese (I think) which were surprisingly tasty, and a couple of mac and cheese balls for which I was holding high hopes. 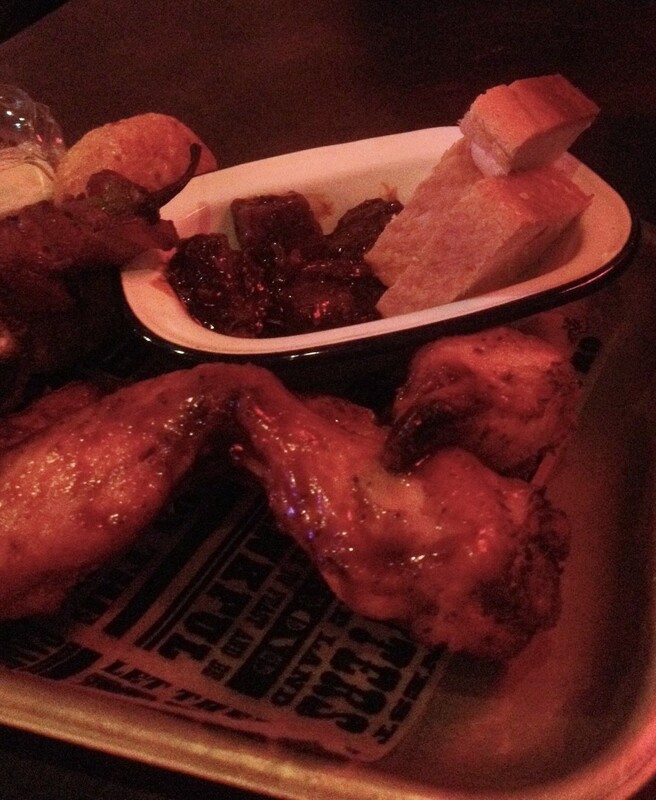 They came with a kind of tangy dipping sauce, described on the menu as a ‘pickleback BBQ dipper’. They were too mild to stand up against the other starters though, however I am hopeful that on their own they would be fine. Both the jalapenos and mac n cheese balls would each set you back £4.95. So in the end we just ordered the Brisket Plate and the Pulled Pork Plate, one did not want to appear too greedy. The Brisket Plate was basically a slice of white bread onto which slices of soft brisket had been lain, on top of that some green chillies and sliced onions had been piled. I was just interested in the meat though so the rest of the stuff was kind of pushed to one side. The brisket was quite soft, tender and had a nice light smoke taste. I found that this went well dipped into the Kansas City sauce (just one of several excellent house sauces). If I was going to have the brisket here at Reds BBQ I would probably order the Smoked Brisket and Burnt Ends Sandwich as I think that would be a winning combination. So you see I did like the Brisket, just not that combination. In general I am really rude about the proliferation of Pulled Pork popping up all over the British Isles. That is not to say that I don’t like Pulled Pork, I do, in fact when it is done properly or really well I absolutely love it. I just seem to have eaten a lot of poor efforts recently. So it was with some hope that we took a chance on the Pulled Pork platter here at Reds, also as I said at the top I wasn’t paying for it so really I had nothing to lose. I am very happy to say that I like their pulled pork. It was very tasty had a really, and I mean, really good smoke to it! The meat we had was tender and juicy and was really good barbeque. I would not choose to have the plate with the slaw again though, for me that was just a total mismatch on the plate, just give me the meat and a decent sauce alongside, that is all I need. If I was to re-write there menu listing I would just say “Pulled Pork from the smoker”, that is all you needed to say. So to summarise, I liked most of the meats that we ate on this occasion, and not just because it was free, the cynical side of me says that I paid for it in kind by telling y’all about it. I will be coming back to try quite a few things and so that will take a while as I will need to rest up between each feast or ‘act of worship’ as they suggest with their promotional materials. I have my eye on the Ribs, more specifically the St Louis Ribs, and also on the Pit Burger. It is going to be a challenge and I may be far more objective when there is an exchange of cold hard cash. My first impressions though were most favourable!